A butcher’s shop that has been trading in Netherfield since the 1960s will close its doors for the final time at the end of the month. 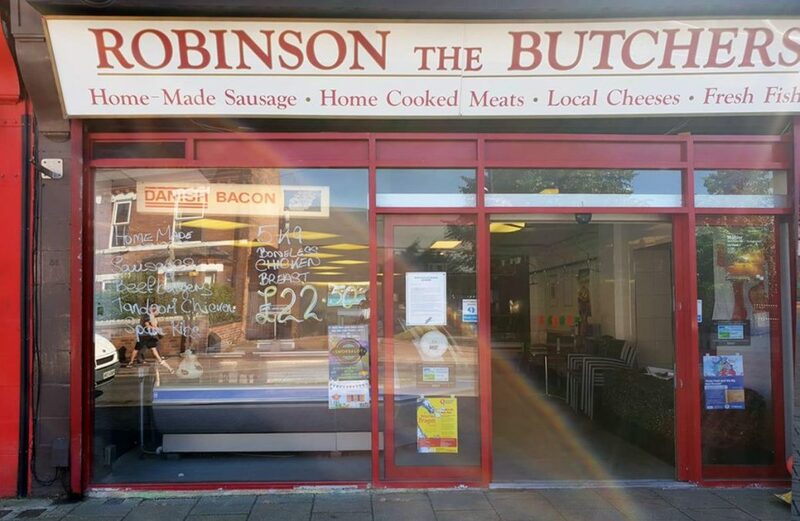 Robinson’s Butchers has been selling meat to people in the town since 1964. A sign has now appeared on the shop front explaining the reasons for the butchers closing, with the last day being Saturday, June 30. The owner of the butcher shop, Mick Robinson, has said that supermarket prices were to blame for having to take the decision to close the business. “Every one of us [working at the shop] are master butchers, which you don’t find anymore, but we find ourselves not wanted in the modern world. Despite the closure of the butcher side of the business, the popular takeaway food outlet based at the site will continue to trade. I am very sad to hear that robo”s is closing down I grew up in netherfield and so did most of my family . I go in there and purchase meat for carlton town fc on match days . And to get my breakfast and dinner too . Without the food being served there I don’t think I would eat proper food in the week so I’m glad that is staying open . All the best for the Robinson family for the future. So sad and sorry to here this. Have been shopping there for at least40 years. Not so much in last 2 years as don,t have a car any more. Would like to wish you all the best in the future. Good luck to you all especially Karl expanding that side of the business. Very sorry to hear this, such quality meat, we should have supported you more, supermarket meat is crap. Robinson’s currently hold a 5* hygiene rating. If you actually took the time to read the original report they were down grated due to paper work error which was soon amended. Nevo is dead. You’ll all be swarming round Arnold high street for your meat now. We’ve got it all. The jewul in the crown of Gedling. Use your local shops, or lose them. The problem is that there are few other shops to lure shoppers. Apart from the Post Office, the Coop and the dentist, it is mostly hairdressers and cafes. I don’t count shops such as key cutting because it’s no not something needed every week. There is such a lot of rubbish. It might be a good idea, when all the shops are shut, to have a weekly streetmarket, as long as it doesn’t comprise 25 stalls selling jeans. TUXFORD’s are the last remaining Butchers in Netherfield with 53 years of experience they have their own farm and own cattle and over 100 years of farming and cattle transporting throughout England , I grew up my whole life in and around Netherfield back in the day there was 8 Butchers shops on the high street and now just the one due to big supermarkets trying to rid all small shops , so please surport all the small shops or they will be a thing of the past . Robin tuxfords of netherfield has been serving the community for over 54 years , tuxfords and robinsons have been good friend for all of thoughs years and i know the team at tuxfords wish the very best for every one who has works at robinsons . So many small business are closing , such a shame as you dont get the service in a supermarket or quality. Tuxfords will be happy to see any new customers. 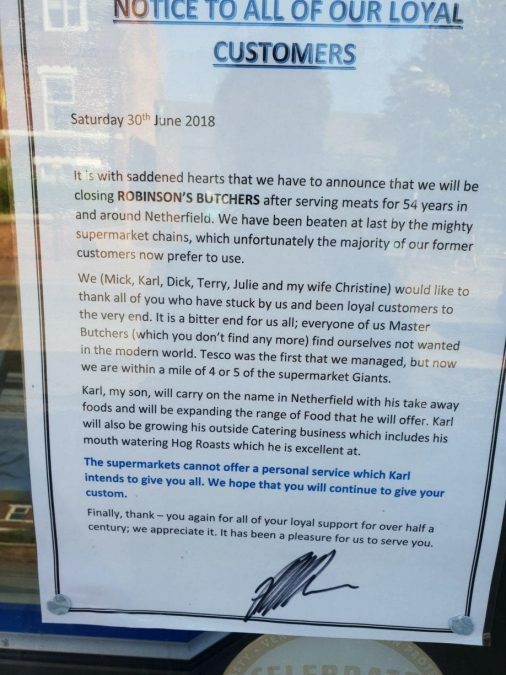 Really sorry to hear this, Karl sold us fantastic meat products to our two pub/restaurants, could not fault the quality or level of service. Guttered this is not good news at all,You make the best sausage ever and the pork pie at Christmas no contest i’m just going to have to buy a chest freezer to stock up.